Stanford researchers have found out that an experiment that, by virtue of design, was not expected to give any notable results instead led to a “bewildering” surprise: a new methodology for producing gold nanoparticles and nanowires with the help of water droplets. According to Richard Zare, lead author of the study and a chemist in the School of Humanities and Sciences and a co-founder of Stanford Bio-X, the method is the recent discovery in the innovative field of on-droplet chemistry and could open the door for more environment-friendly techniques to create nanoparticles of gold and other metals. The technique has been described in the Nature Communications journal on April 19, 2018. “Being able to do reactions in water means you don’t have to worry about contamination. It’s green chemistry,” stated Zare, who is the Marguerite Blake Wilbur Professor in Natural Science at Stanford. Gold is termed a noble metal due to its relatively unreactive nature. In contrast to base metals such as copper and nickel, gold is highly resistant to oxidation and corrosion, which is why it is widely used for making jewelry. However, in the mid-1980s, researchers found out that gold’s chemically unreactive nature is exhibited only at large (or macroscopic) scales. However, at the nanoscale, gold particles are chemically highly reactive and act as exceptional catalysts. At present, gold nanostructures are being used in a broad array of applications, such as biosensors, toxic gas detection, drug delivery, and bio-imaging. However, to date, the only reliable method for producing gold nanoparticles was to blend chloroauric acid, the gold precursor, with a reducing agent, for instance, sodium borohydride. During the reaction, electrons from the reducing agent are transferred to the chloroauric acid, thereby releasing gold atoms in the course. Based on the way the gold atoms get clumped together, they form prisms, rods, wires, nano-size beads, and more. In the recent past, Zare and his team were speculating whether the gold-producing reaction would progress in a different way upon using tiny, micrometer-sized droplets of chloroauric acid and sodium borohydride. What is the size of large a microdroplet? “It is like squeezing a perfume bottle and out spritzes a mist of microdroplets,” stated Zare. From earlier experiments, the researchers had an idea that certain chemical reactions progress considerably faster in microdroplets than in volumes of larger solution. In fact, the researchers found out that the gold nanoparticle enlarged by more than 100,000 times faster in microdroplets. Yet, the most remarkable observation was done while performing a control experiment in which the reducing agent—which normally liberates the gold particles—was replaced by microdroplets of water. “Much to our bewilderment, we found that gold nanostructures could be made without any added reducing agents,” stated Jae Kyoo Lee, a research associate, who is the first author of the study. 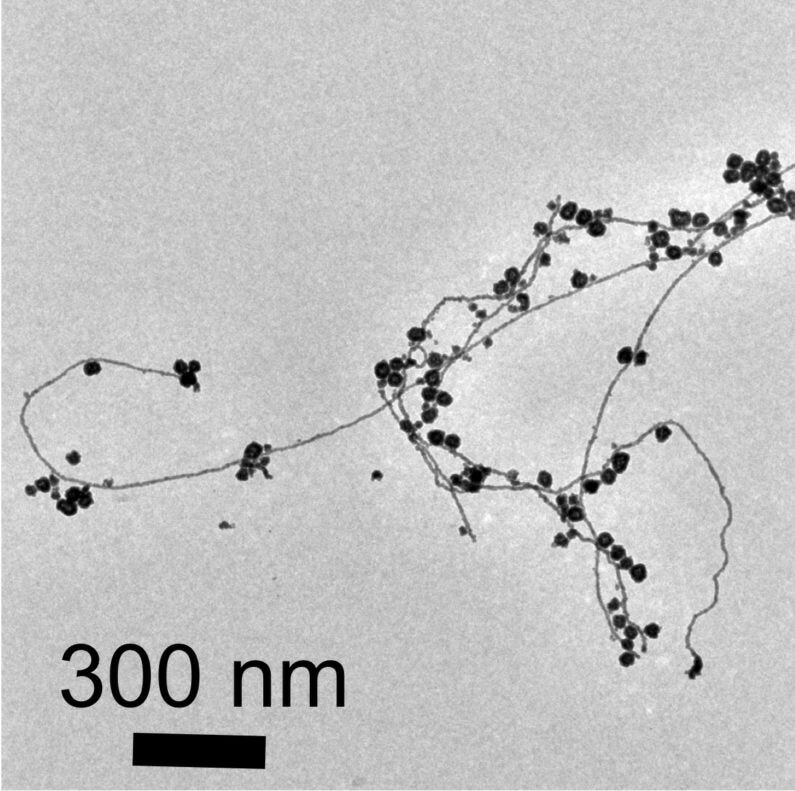 Upon being observed under an electron microscope, the gold nanowires and nanoparticles seemed fused together similar to berry clusters on a branch. The chance discovery indicates that pure water microdroplets can act as microreactors for producing gold nanostructures. “This is yet more evidence that reactions in water droplets can be fundamentally different from those in bulk water,” stated Devleena Samanta, the study co-author who is a former graduate student in Zare’s lab and also a co-author on the paper. Zare stated that if the process can be commercialized, the need for using potentially toxic reducing agents with harmful health side effects or the potential to pollute waterways can be avoided. However, there is still no clear explanation for the ability of the water microdroplets in replacing a reducing agent in this reaction. One probability may be the fact that when water is transformed into microdroplets, its surface area is considerably increased, paving the way for the formation of a strong electric field at the air-water interface, which might boost the formation of gold nanowires and nanoparticles. The researchers have been looking for ways to employ the nanostructures for different biomedical and catalytic applications and to enhance their method to produce gold films. “We observed a network of nanowires that may allow the formation of a thin layer of nanowires,” stated Samanta. Zare is also a faculty fellow of Stanford ChEM-H and also a member of the Stanford Cardiovascular Institute, the Stanford Cancer Institute, the Stanford Neurosciences Institute, and the Stanford Woods Institute for the Environment. This study was funded by the U.S. Air Force Office of Scientific Research through Basic Research, the Institute for Basic Science in Korea, the Winston Chen Stanford Graduate Fellowship, the Center for Molecular Analysis and Design, and the National Science Foundation. Hong Gil Nam at DGIST in South Korea was the other co-author of the study.